Guess what happened two and a half years ago. We first seeded the Meadow, and now we have a thriving landscape of native plants in a highly visible spot on campus. Those plants need some assistance as we prepare for the third season of growth. 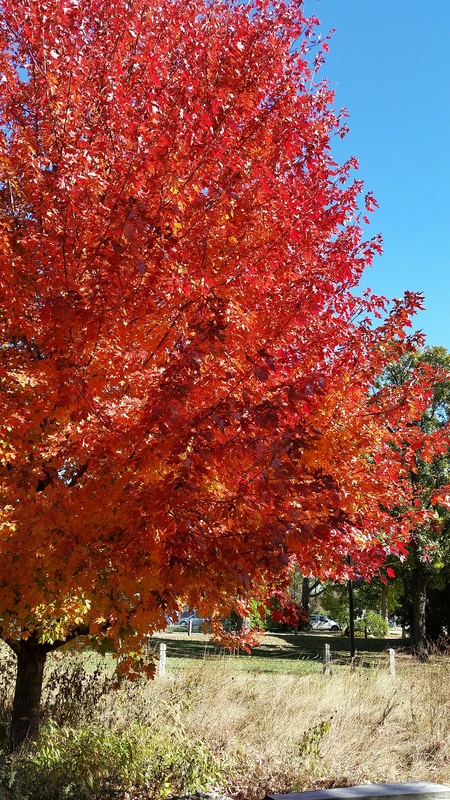 So on Saturday, Nov. 7, from 10-1 p.m. we hope to remove excess vegetation so the plants have room this spring. Those who have rakes, please bring them! And you may want your hat, work shows and work clothes. We’ll do some wildflower ID-ing and learn about our native grasses as well as take some time out for some apple cider and goodies. 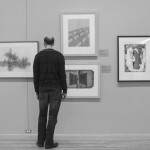 Guest post by Marissa Pilolli, an intern at the Beach Museum of Art, and The Gordon Parks Project. Marissa has a Bachelor’s in Art History and Religion and Certificate in Museum Studies from Florida State University. The initial idea to photograph museums came to me this past spring semester just before I left for a spring break study abroad trip to London. At the time, I was also enrolled in a darkroom class and we were expected to return after the break with images for a critique. In my mind, it made perfect sense to save myself some steps and photograph my time in London, which happened to be mostly composed of visiting museums. It wasn’t until I returned home and began processing my film that I realized the photos served more of a purpose than simply documenting my time abroad; they became a starting point for me to justify decisions I was making in other classes. 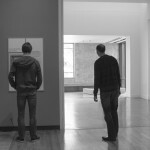 I learned from my photos (at least on a rudimentary level) how visitors were spending their time in each museum. You can learn a lot from exposure settings alone. 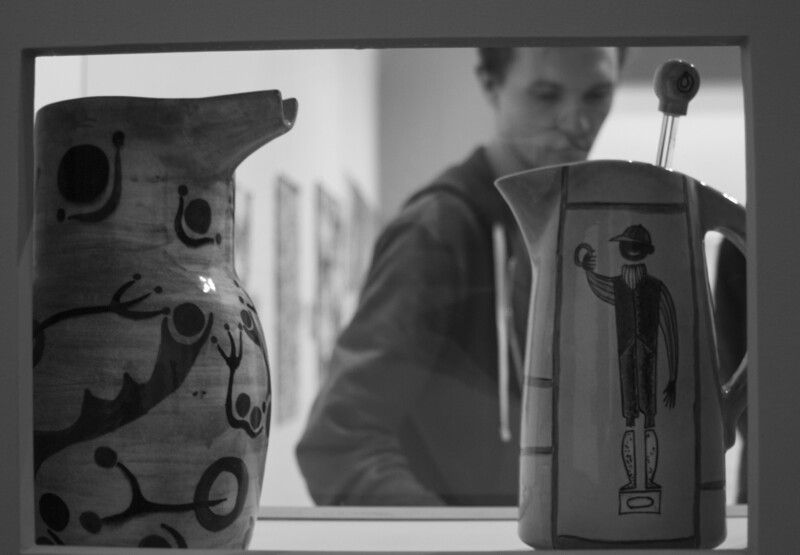 For example, if you are using a slow shutter speed and only stationary objects are in focus, you can tell that visitors were not spending much time interacting with those objects. I was reminded of my interest in photographing museum spaces after I attended Liz Seaton ‘s talk on October 1 where she discussed Associated American Artists and the long process of putting together Art for Every Home. This time, I wanted to get more specific so I asked my boyfriend Tom and his friend Rob if they would be willing to let me take pictures of them as they walked through the Beach Museum’s exhibits. Luckily, they were both up for it. As I began to follow Tom and Rob through the first gallery I found it more difficult than I imagined it would be to position my camera and myself without becoming a distraction. This is ultimately why many of the images I collected were taken from behind. I didn’t really have a specific question I was trying to find an answer to; I was more interested in just observing them as they maneuvered their way throughout the show. As time went on I found it easier to follow and things began to stand out. The most memorable was that Rob seemed to be moving much faster than Tom. 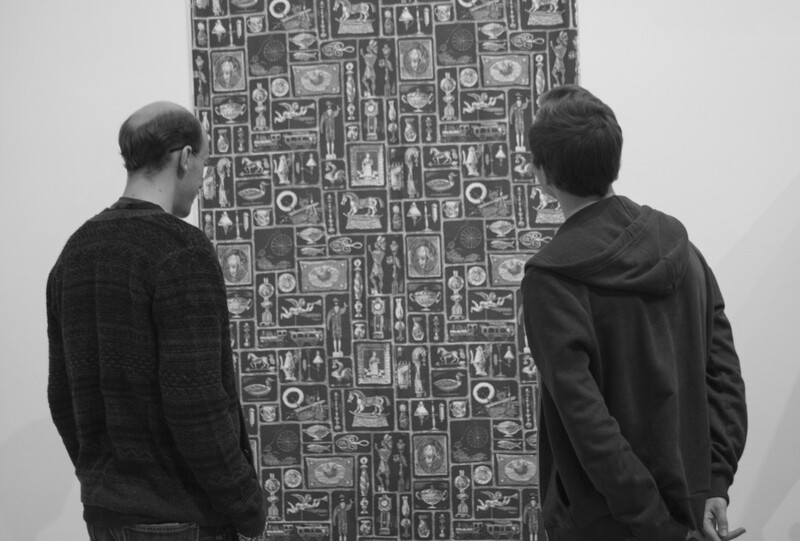 They also did not follow the same path when walking through different parts of the exhibition. Tom seemed to follow more along the sequential order of how the objects were placed while Rob would sometimes walk past objects out of order and more than once. As we were leaving the museum, I asked each why they thought that might have been the case and it seemed to boil down to a difference of opinions as to what is important to look at. 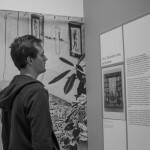 For Tom, the information provided on plaques throughout an exhibit are just as important to look at as the objects themselves as they often provide information for him to better contextualize what he is seeing within a larger picture. Rob on the other hand prefers to focus more on the objects only reading accompanying information once something particularly sparks his interest. Rob also pointed out that he generally finds such information to be “boring” and prefers insight into the artist’s perspective to background information that he could find online. I do not think that either one is more correct in their method of viewing an exhibit, just as two individuals are unlikely to have the same perceptions of a work of art, each visitor to a museum brings with them their own unique perspective and set of expectations. It is then up to the museum to figure out how to balance its own unique and meticulously thought out perspective with that of the community it serves. By providing items such as handouts, hosting talks, and even private tours at very little to no cost, museums such as the Beach ensure that visitors with varying expectations and interests are able to get the most out of their museum experience. Exhibitions take a tremendous amount of planning and coordination. 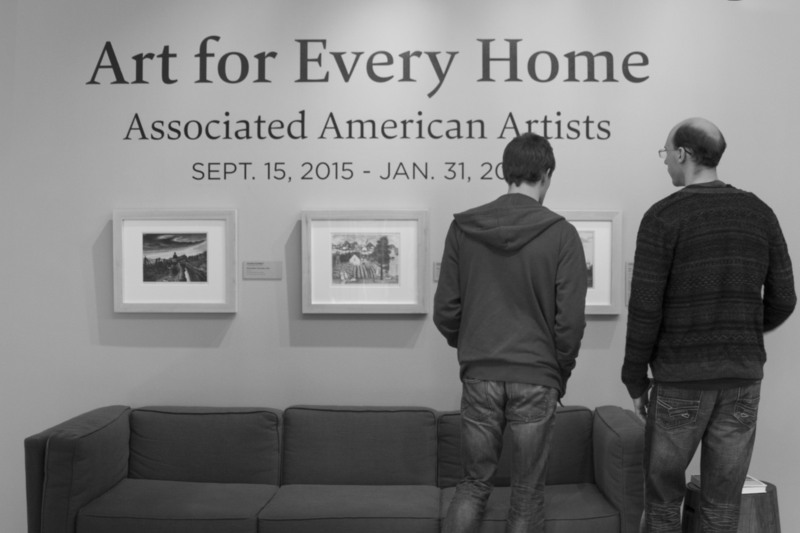 Beach Museum of Art staff have worked on “Art for Every Home: Associated American Artists” for over seven years. Below are some facts about this exhibition. Associated American Artists (AAA) of New York (1934-2000), was a business that sold American art via mail-order catalogue with a goal of making art accessible for everyone. 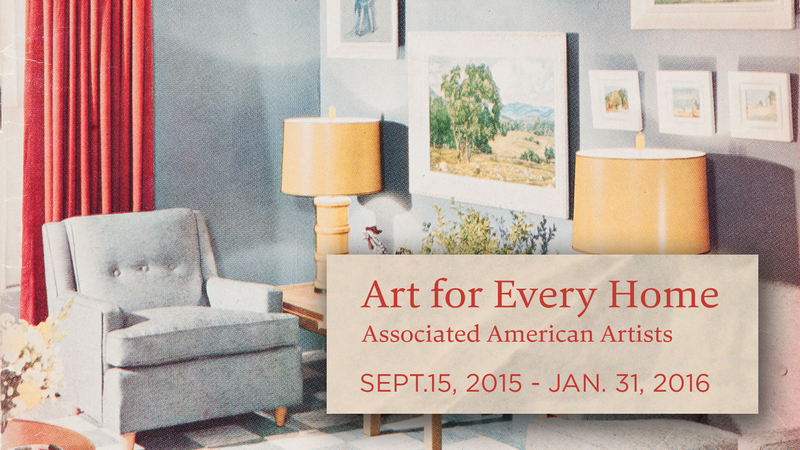 The exhibition provides an overview of AAA’s contribution to the history of American art, printmaking, ceramics, textiles, and interior design. 137 prints, paintings, ceramics, glass work, and textiles are in the exhibition. Items are borrowed from 27 private and museum collections. Loan agreements were made for each piece and museum staff arranged shipping to the Beach Museum of Art. Substantial research: 100 online collection databases for AAA objects were consulted, travel to review archives in Washington, DC. Organizers traveled to approximately 35 museums and private collections to see works. Selections include visually compelling objects that touch on important aspects of the AAA story. Production of a major catalogue with 14 essays by 10 contributors. Catalogue design coordinated by Marquand Books of Seattle, WA; printed in China and distributed by Yale University Press. Production of an illustrated list of AAA objects: more than 2500 prints, 250 ceramics, and 350 textiles available as a free pdf document. Collaboration on exhibition design with Tim Durfee of Los Angeles. Matting and framing of substantial portion of works in exhibition. Production of wall panels and object labels: succinct and compelling presentation of AAA story. It has been a busy planning process but the show looks phenomenal, so make sure to get in and check it out. For more information visit the exhibition page on our website. The exhibition will be on display through January 31, 2016.